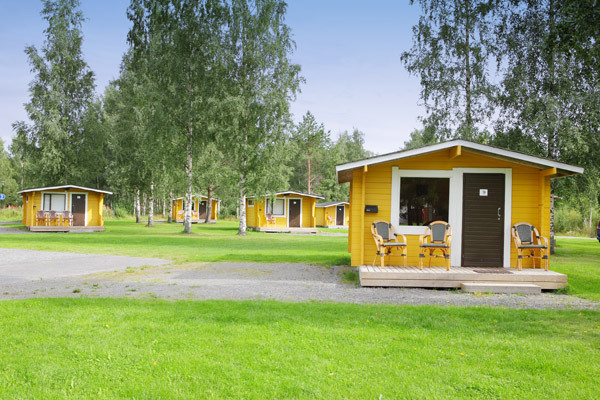 Basic cottages are available in summertime. The cottages which are meant to be used by 4 persons are all equipped with the following: 1 bunk bed, 1 couch which can be brooded , out-spread. The cottages are also equipped with a table, a set of chairs,a refrigerator and a radio. Furthermore the cottages are also equipped with electric heating. The cottages are all situated within a distance of 50 meters from the maintenance-building. Check in time 3 PM and check out time 12 AM. The basic cottage doesn't include bed sheets or towels. If you want, you can rent bed sheets from us, price is 5 €/set and towel is 3 €.